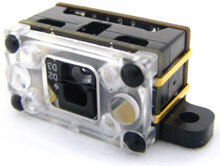 The Code Reader 8000 (CR8000) is a patented, high performance, miniature barcode imaging engine. The Reader 8000 (CR8000) continues Code's legacy of dual optical fields: while most devices have a single field enhanced for a specific application, the Code Reader 8000 (CR8000) has both a high density field for reading the smallest of barcodes, and a wide angle field for reading oversized barcodes giving you two readers in one. The Reader 8000 (CR8000) includes connectivity for Code's Glare Reduction Technology. Barcodes printed on shiny or reflective surfaces have typically been problematic for imaging based barcode readers. Code has overcome this challenge with a patented process that significantly reduces the reflections thus making the barcodes easily identifiable. In addition, Code has designed in functionality to allow the integration and control of additional illumination blocks or elements. Applications includes document scanning, direct parts marking, or other applications that require expanding lighting. The Code CR8011-L00-MT1-C800 is also known as CR8011-L00-MT1-C800	or CR8011L00MT1C800	.